So I am home today with a sick little boy, and I am starting to not feel so good myself, but I have work to do and can not slow down!!! I am finishing up some of my bigger items to take down to Frederick this weekend, but I also wanted to have some smaller little details in my booth for valentines day…that means hearts and glitter!!! And maybe a combo of both! But I thought I would share with you one of the little details I worked on today. I embroidered this little heart on an old grain sack. I wanted a little touch of love on a pillow to sell and thought this would be sweet. My grandmother Dorothy used to embroider dish towels and taught me to when I was little. 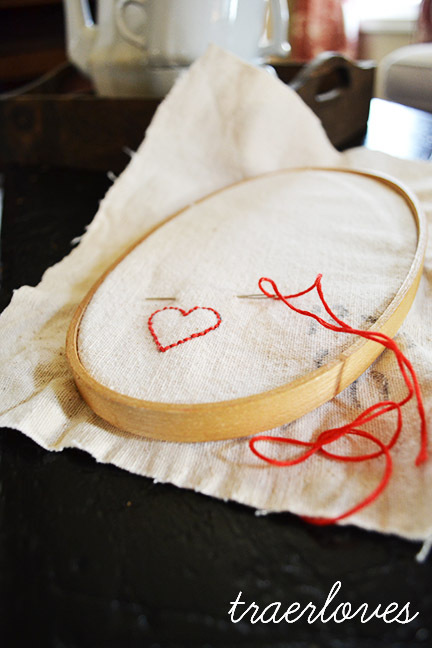 I haven’t gotten out my hoop and needle in years but since I have started my creative business I get to do all kinds of fun things under the pretenses of it being for my “business!” All I can really remember how to do is a simple stitch, but it gets the job done. I don’t think embroidery is as popular as it once was, in fact, I think it might be a dying art. So if you have embroidery experience and want to teach me some new stuff, please let me know, so we can bring it back! Well I am off to finish up some more details for my upcoming sale and I suppose I should check in on what the kids are up too! Tomorrow I will show you my large ottoman! I finished sewing her today and gave her a good ironing, so tomorrow I will finish getting her ready for the photo shoot. Here is to hoping you are having a terrific Tuesday! This entry was tagged embroidery, embroidery experience. Bookmark the permalink. My Mom still does embroidery work on pillowcases, Christmas stockings and other projects. My Mom taught me a few stitches a long time ago, but I’m not sure how much I remember.